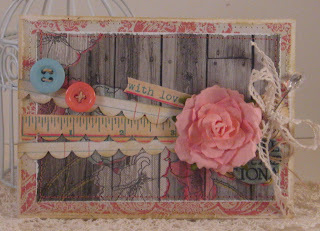 DP's from from MME, cardstock, buttons, twine from PTI, decorative pin from Maya Road, chipboard buttons from OA, paper flower from Prima and misc. crocheted trim. Great card! I love it. I also like the bunny card below.